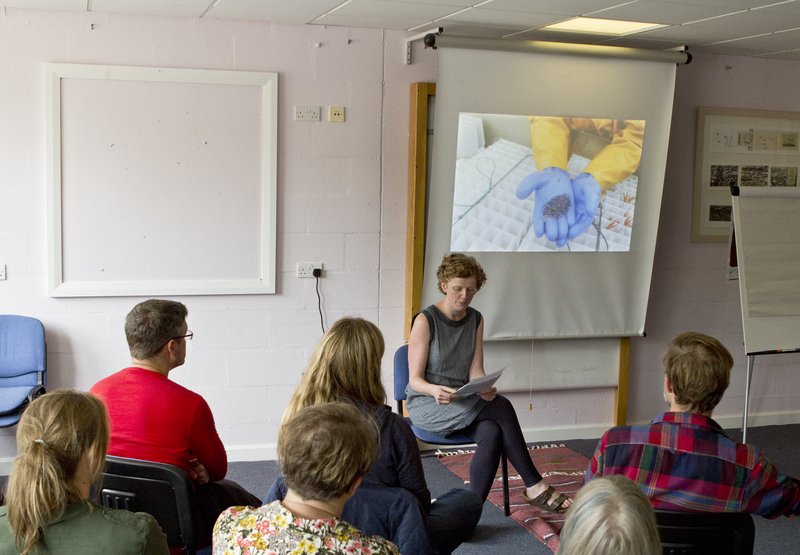 A few weeks ago, we held for our first Ullapool Green Tease, run in collaboration with An Talla Solais as part of their summer exhibition ‘Murmur – artists reflect on climate change’, curated by Jonathan Baxter. 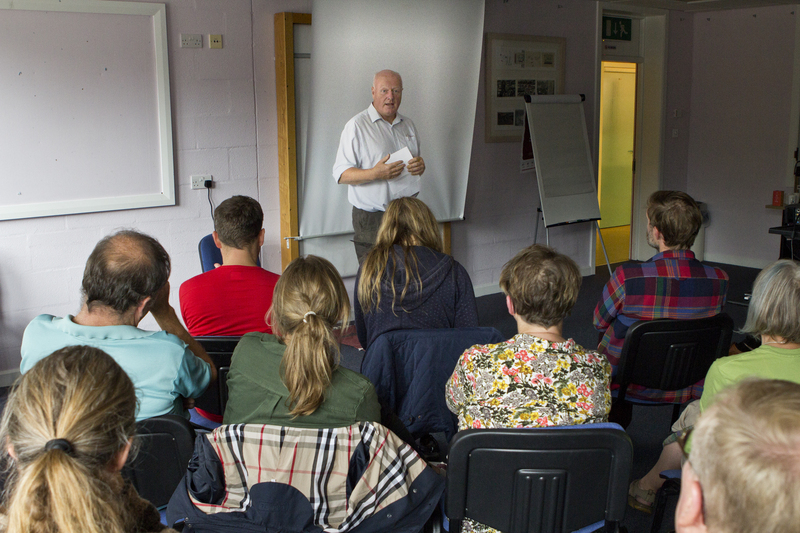 A group of around twenty of us gathered in the MacPhail Centre, the building which hosts the Ullapool’s high school and library, as well as providing spaces for theatre performances, conferences and meetings. 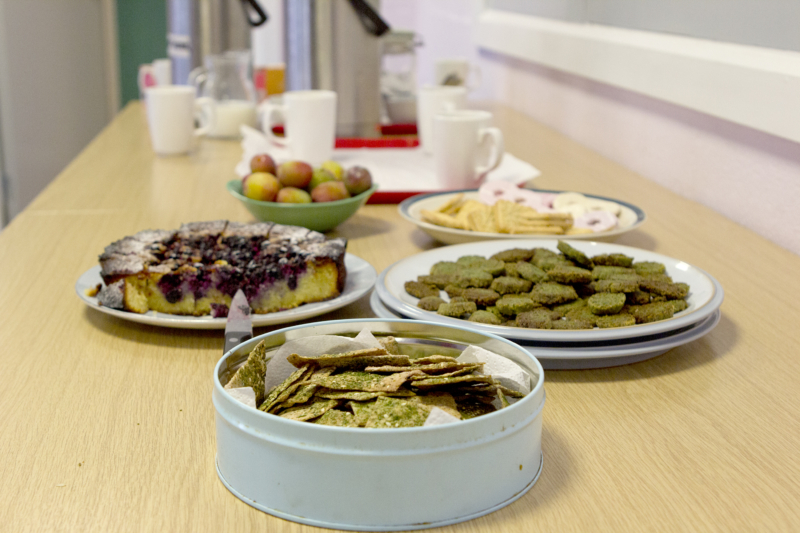 Over seaweed biscuits and tea, we heard short presentations by Gemma (Creative Carbon Scotland), exhibiting artist Sarah Gittins, Lindy Young and Anna Reid from Deveron Projects and local resident, boat builder and teacher Topher Dawson and held a discussion about the links between creative practices, community resilience and climate change. Following introductions, Gemma outlined Creative Carbon Scotland’s culture/SHIFT programme which seeks to explore how artistic practices can contribute towards the significant social transformation required to meet national and global carbon reduction targets and adapt to a changing climate. We see the arts as playing a key role in this transformation in various ways, including through its ability to create and bring communities together, make the invisible causes and impacts of climate change visible, and by helping society to think in new ways about complex issues and imagine different futures. Sarah Gittins shared with us reflections from her research residency in Ullapool which explored the nature of local livelihoods based upon working ‘on, in or with the sea’, out of which she developed a series of printed works titled ‘Sea Tangle’. Established by the British Fisheries Society in 1788, Ullapool has long been an active fishing port, surviving numerous busts and booms in the herring industry and supporting both small and large-scale fishing operations. Much of its current fishing catch is transported by refrigerated lorries to fish markets in Southern Europe. The drawings which emerged from Sarah’s conversations and encounters shone a light on the complex interaction between local fishing practices, the marine ecosystem and how it is being and will be impacted by climate change in the future. We were told the story of the increasing numbers of swimming octopus and squid found in Ullapool waters. A result of rising sea temperature levels and predator loss, this change in the marine ecosystem has had a knock-on effect for shellfish populations, impacting the livelihoods of those dependent on creel fishing. The octopus became an important symbol in Sarah’s drawings, encompassing what local writer John MacIntyre described as the need to “learn to think in tangles” to address the complexity of the challenges posed by climate change. From Deveron Projects and Topher, we learned about some different approaches to building community resilience. 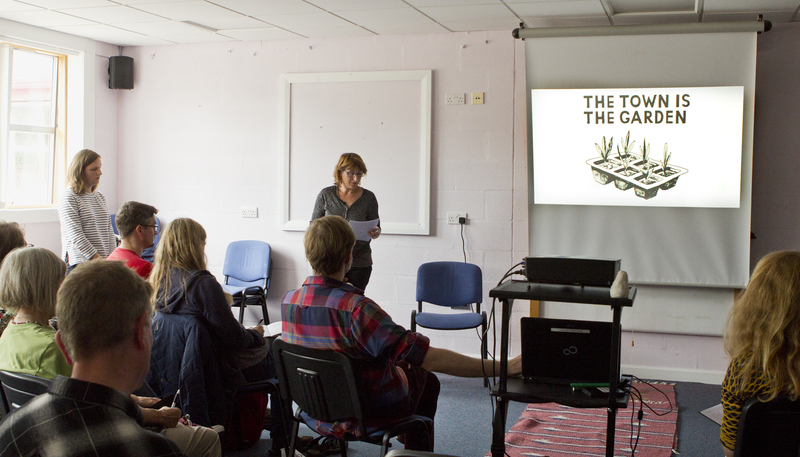 Anna and Lindy introduced the Deveron Projects’ ‘50/50 model’ which aims to bring together the organisation’s artistic endeavours with the needs and interests of the local community in Huntly, following the maxim of Patrick Geddes ‘think global, act local’. Their current project ‘The Town is the Garden’ is supporting 100 residents to take up food growing initiatives, through which they will explore the wider question of what a sustainable food culture for the town could look like. Topher shifted our attention from food to energy. He shared his experiences of living off-grid on Scoraig, a settlement located on a peninsula south of Ullapool on Little Loch Broom, highlighting the different relationship Scoraig’s residents have with their energy, and one another, being acutely aware of how one’s individual behaviour fits into a wider whole. He argued for the role of aesthetics in helping to change perceptions of landscape and increasing society’s connection to how energy is produced and consumed. Topher concluded by asking what would it take for local residents to find beauty and power in a wind turbine situated in full visibility on a hill overlooking Ullapool. The Land Art Generator Initiative, which has a project currently under development in Glasgow, was referenced as a project which seeks to build popular acceptance of clean energy by integrating art and interdisciplinary creative processes into the development of renewable energy generating public artworks. In different ways, the presentations highlighted the role which artistic practices can play in making new connections between previously disconnected areas, offering a means by which to approach and represent problems from a systems perspective. This ability to think at a systemic level is vital if we are to ensure the prosperity of the natural ecosystems and human societies, now and in the future. This was highlighted in ecological artist Newton Harrison’s recent talk at Woodend Barn and is something Creative Carbon Scotland is exploring through our Embedded Artist Project. Arts spaces such as An Talla Solais offering important spaces in which to dwell in challenging questions, open-up debates and take risks. 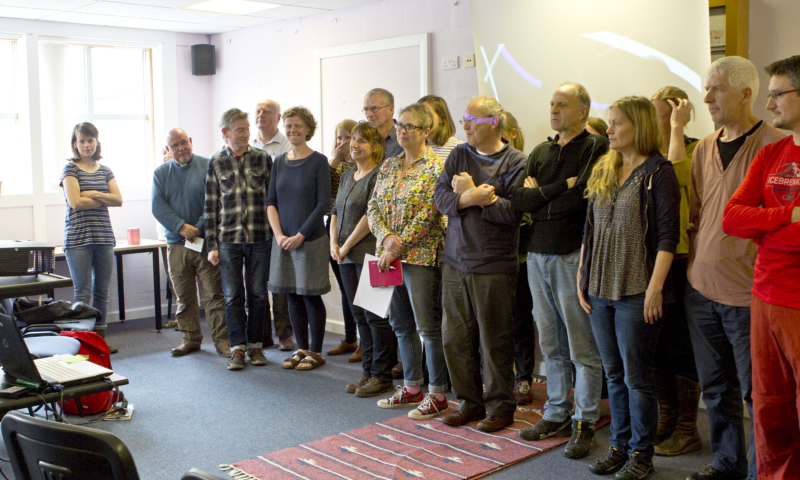 We concluded by collating a list of skills, resources and community qualities which could be put towards the further development of an arts and sustainability network in Ullapool and the wider region in the future. Thanks to everyone who joined us for the event! Green Tease is an ongoing informal events programme which connects creative practices and environmental sustainability. Find out more about previous and upcoming events and how you can get involved in the Green Tease network here.